"David Icke, the Reptilian Infiltration, and the Limits of Science Fiction" from the April 2 edition of Strange Horizons, a brilliant exploration of the sub-Ballardian, post-L. Ron world of people who believe we are secretly governed by a malevolent alien reptilian conspiracy (fear and loathing). "The King's White Beard" from Vanity Fair, a beautiful little essay exploring the manner in which our cultural idealism misdirects our attention away from the pragmatically urgent. 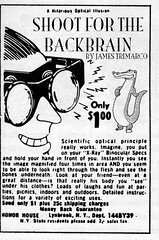 "Shoot for the backbrain" from RevolutionSF, an amusing bit of adbusting SF from an insider's POV.